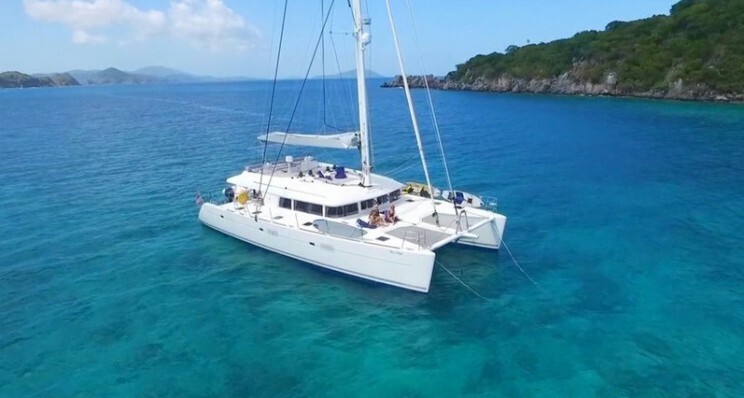 TELL STAR Catamaran : The ultimate dive boat in the BVI, accommodating 8 guests in 4 cabins. 2 Dive Masters, 1 Rescue Diver and a certified Red Cross Lifeguard all aboard Tellstar. The perfect combination of sport, relaxation and gourmet treats! The ultimate dive boat in the BVI, accommodating 8 guests in 4 cabins. 2 Dive Masters, 1 Rescue Diver and a certified Red Cross Lifeguard all aboard Tellstar. The perfect combination of sport, relaxation and gourmet treats! $27,500 to 32,500 per week, all inclusive. Bret started his life on the waves with his brother and a Siberian husky, sailing the world for three years. First mate Mallory is an incredible cook and has plenty of energy to make sure your charter is completely stress-free. Mallory is keen to get involved and show you the ropes of all the water toys on board Tellstar and along with Tyler (Bret’s brother), will tend to your every need. Tyler is a great entertainer and is a natural with all things sport. The perfect choice for active groups!